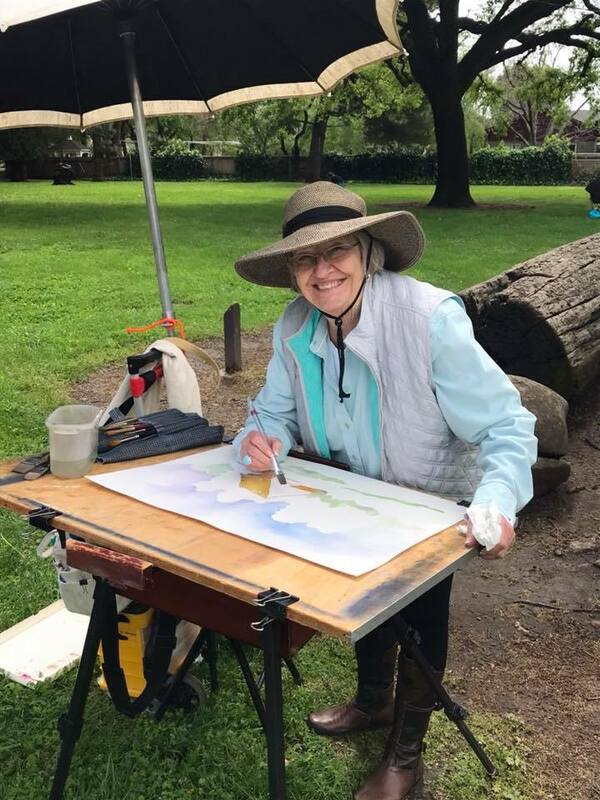 Fairfield’s Sandy Imperatori and members from art workshops she has conducted in Rancho Solano and Vacaville were at Peña Adobe Park for our returning plein air event. Sandy studied BFA Graphic Design at Carnegie Mellon University and has conducted the Plein Air Workshop in Virginia City, Nevada for over 20 years. The former Gallery Director of the Fairfield Visual Arts Association, Sandy began drawing and painting as a young child, and has been painting watercolor for 25 years, which has led to several awards. Joining Sandy and local artists were members of the Vacaville Art League and Gallery! Established in January of 1963, The Vacaville Art League is a nonprofit organization dedicated to the development and promotion of the visual arts. Located in the 129-year-old Segura home on Monte Vista Avenue, the Gallery has provided a place for the public to participate directly in the visual arts since opening on March 16, 1968. The McBride Senior Center Acoustic Jam Group, under the direction of Terry and Leslie Cloper, performed at the Peña Adobe Park during the “Artists at the Adobe” event. Martin and Sue and members from the Jam Group sang and played a variety of instruments including the guitar, banjo, mandolin, fiddle and harmonica. They meet the first and third Wednesday of the month at the McBride Senior Center at 91 Townsquare in downtown Vacaville. Artists brought their art supplies and joined the fun and some enjoyed a picnic lunch. Docents where on hand to answer questions and conduct tours of the Peña Adobe, built in 1842 by the Peña family and the adjacent Mowers-Goheen Museum.